Well, I missed our town's Friends of the Library sale earlier this year because I was pregnant and wasn't in a condition to be able to haul large bags of books around. So I consoled myself by going to the library sale one town over. The selection was much, much smaller (and WOW did I appreciate our town's sale!!) but I still walked away with a thing or two I was excited to find. I may and/or may not have picked up extra copies of books that I already own, some with the express intent and purpose of giving away to some of you during upcoming challenges. ;) And then I picked up a duplicate book by accident which you can find out more about below. 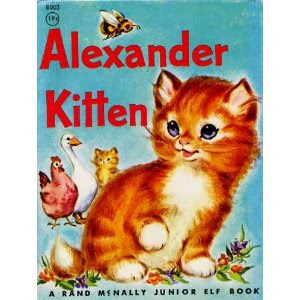 This story, written by Jessica Potter Broderick, tells the story of little Alexander who feels it is his Duty to chase away strange creatures and hurt them before they hurt him. However, being a tiny little kitten doesn't allow him to win many of his battles. After he attempts an attack on his great grandfather, it is suggested that he might try being friendly or simply leaving other creatures alone. Alexander tries this and discovers that life is a lot more fun when you aren't running around attacking everything in sight. We're still working on building our Thanksgiving home library around here. (I've found this to be a surprisingly difficult holiday to find books for. I'm not sure why this is - but Thanksgiving and Valentine's Day have been a challenge!) 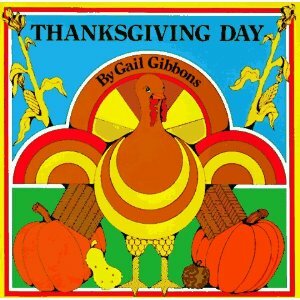 I don't think you can really go wrong with Thanksgiving Day , by Gail Gibbons though. The illustrations are very simple. The page spreads have a bold look to them but are easy on the eyes. She describes Thanksgiving in a manner that I desire to have it represented to my children, complete with Pilgrims wanting to travel to a new land where they could worship God as they please. For $0.50 - this is a winner! 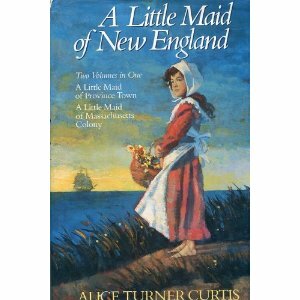 I know nothing about A Little Maid of New England: A Little Maid of Province Town / A Little Maid of Massachusetts Colony . I picked it up based on price, cover art and the book flap description. Anyone have a history or reading experience with this title? I'm very curious to read it. 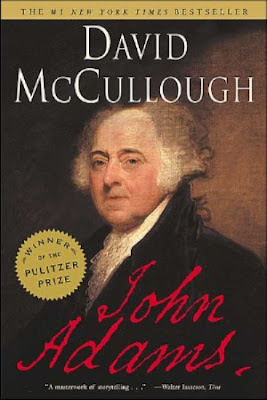 I haven't read it, but after watching the mini series on John Adams (linked to my thoughts) I feel like I ought to read the book. I've wanted to. I just haven't. Again, for $0.50, how could I NOT!? Apparently I'm not connected enough to Dickens to have realized that I already owned Dickens' Christmas stories. 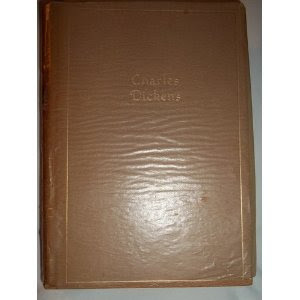 I picked up this copy of Dickens' Christmas stories. The volume includes A Christmas Carol, The Chimes and The Cricket on the Hearth. I already own this copy which includes the aforementioned stories along with The Battle of Life and The Haunted Man. I was planning to read this book this year. But now I have a pretty hardback edition to give away! Would you like to win the copy I picked up at the Library Book Sale (the one with three Christmas stories inside?) Simply leave a comment below including a valid e-mail address. This contest is open to U.S. and Canadian residents and will be open through Monday, November 28th. I'm happy to share the wealth and if you'd like to read Dickens alongside me this December, let me know. As the regulars around here know, I'm not actually a fan of Dickens. Like, at all. However, I DO love A Christmas Carol so perhaps I'll just like him in holiday fashion. I'm willing to take a gamble on it. Clearly. I've bought the book twice now! Hope you all enjoy your Thanksgiving week and here's a chance at a Christmas book to get you going during the month of December. A classic, to boot! Well, my only experience with Dickens is Great Expectations...as a junior or senior in high school. I didn't care for it. However, you can talk me into just about anything, I think! I'm willing to give A Christmas Carol a try. oops...derekannette at gmail dot com Just to be following the rules! I love library sales! Looks like you got some treasures!!! My favorite way to listen to Dickens is as an audio book read by a good British reader while working in the sewing room, cleaning the bathroom or riding in the car. I'm currently listening to Bleak House. I would be tickled to add this Christmas collection to my library! I would love to win it! I used to teach A Christmas Carol before kids... but I don't have it for our family library. My hubby loves old books. He just loves having them around to pick up and browse through. I know he would love this. Please enter me. Oh my, I had forgotten about Come Over to My House! 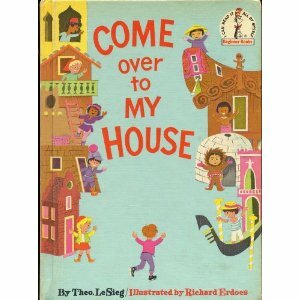 We had it when I was little, and it was one of my favorite books to look at. (This was before I could read. Of course, I had it memorized because my mom read it aloud to me so much.) I wonder if my parents still have it? P.S. I'm not entering the giveaway, just commenting 'cause I was so excited to see an old friend. I would love to have a copy of it. I was going to buy it last year, but then I forgot to. It would be great to read with the holidays coming up. I'm with Megan--not entering but I loved Come Over to My House when I was a kid. I still have my copy and would never part with it. I loved it too! Love, love, love your finds!!! :) Seriously, one book lover to another, I'm sharing your excitement! And I've read one of McCullough's books and want to read them ALL--some day, chuckle. I love Come Over to My House! My grandma had a copy we read when we were little, I'll have to find out next time I visit if she still has it. Hope so because that would be the only way to get a copy (I won't pay those prices on Amazon). Please tell me you have at least read A Christmas Carol. Please? Whether you like Dickens as a general rule or not, this short novel is probably the one book best known and most often made into a movie. This year, the kids and I read it together.